Testicular metastasis from a solid malignancy of the distant organ is a rare entity and prostate, gastrointestinal tract, lungs, skin, and kidneys are the common primaries. Gastric carcinoma with testicular metastasis is an extremely rare entity with only few cases reported in the literature. Most of the testicular metastases are unilateral. Synchronous bilateral testicular metastasis is an extremely rare situation in gastric primary. We report a first case of synchronous bilateral testicular metastasis in a treated case of gastric carcinoma in India. Testicular metastasis constitutes only 0.9% among all the testicular tumors. With the exception of the infiltration of leukemia and lymphoma to the testes, testicular metastasis from a distant organ is a rare entity accounting for 0.02% to 2.5% of the cases. The most common solid primaries for testicular metastasis are prostate (35%), lung (18%), skin (11%), and kidney (9%). Testicular metastasis with gastric primary is an extremely rare entity with only approximately 15 cases have been reported worldwide, and all the reported cases were having unilateral testicular metastasis. Here, we report a simultaneous bilateral testicular metastasis in a treated case of gastric carcinoma in a 66-year-old male. A 66-year-old male with a known case of gastric adenocarcinoma presented with dragging sensation in bilateral inguinal region and pain in the right testis 24 months after the completion of treatment for the gastric carcinoma. Initially, the patient had presented with anorexia and epigastric discomfort 53 months ago. Upper gastrointestinal endoscopy revealed a large infiltrative growth at body [Figure 1]a. Contrast-enhanced computed tomography (CECT) scan abdomen showed concentric wall thickening of pyloric antrum with wall thickness varying between 12 and 14 mm associated with multiple nodes in subpyloric and hepatogastric ligaments [Figure 1]b. The patient underwent distal radical gastrectomy with Billroth-1 anastomosis. The postoperative gross specimen on microscopic examination revealed the pathological TNM (tumor, node, metastasis) grouping of PT3N2MX stage IIIA. The patient received six cycles of adjuvant chemotherapy with the PCF regimen (Paclitaxel 175 mg/m2 and carboplatin area under the curve 6 on day 1, and 5-fluorouracil 600 mg/m2 on day 1–3 once on every 3 weeks) and completed in September 2015. The patient was on regular follow-up until September 2017. After 24 months following completion of the treatment, the patient came with the above-mentioned present complaints. Ultrasonography (USG) of scrotum revealed bilateral enlarged testis with multiple hypoechoic well-defined lesions throughout bilateral testicular parenchyma. USG of the abdomen and pelvis showed bilateral enlarged iliac and inguinal lymph nodes, largest size– 16 mm. CECT scan of the abdomen and pelvis revealed bilateral testicular enlargement with multiple hypodense lesions within parenchyma [Figure 2] and multiple retroperitoneal and inguinal lymphadenopathy. These findings were consistent with testicular tumor. However, the serum markers beta human chorionic gonadotropin (β-HCG) and alpha-fetoprotein (AFP) were within normal limits. The patient underwent bilateral orchidectomy. Macroscopic examination of the resected specimen revealed left testis measuring 9 cm × 7.5 cm × 6 cm and the right testis measuring 8.5 cm × 8 cm × 6 cm. Cut section of the bilateral testes showed focal firm areas that appeared white nodular. Microscopic examination of the bilateral testis showed features of metastatic adenocarcinoma with intravascular tumor emboli and perineural invasion [Figure 3]. These features suggest a bilateral testicular metastatic adenocarcinoma that is consistent with an origin in the patient's gastric carcinoma. Organ-specific metastasis from a distant primary may result due to variety of mechanisms such as trapping of tumor cells due to different pattern of blood flow from the primary tumor to the first capillary bed followed by tumor cells to aggregates, specific adhesive interactions between tumor cells and the endothelia of certain organs, and generation of tumor cell niches by the microenvironment of a distant organ for metastatic cells to colonize. Testicular metastasis may occur by the several routes of spread such as direct invasion, retrograde venous embolism, arterial embolization, retrograde lymphatic extension from paraaortic lymph nodes, transperitoneal seeding through a congenital hydrocele, or retrograde extension from the vas deferens. The gastric cancer spreads by direct extension through the gastric wall, through lymphatics, hematogeneous channels, and seeding of peritoneal surface. Pancreas, colon, and liver are common sites for the spreading of gastric cancers. It can spread to ovary in females through lymphatic channels and is known as Krukenberg's tumor. However, its counterpart of spreading to the testes in males is quite rare. 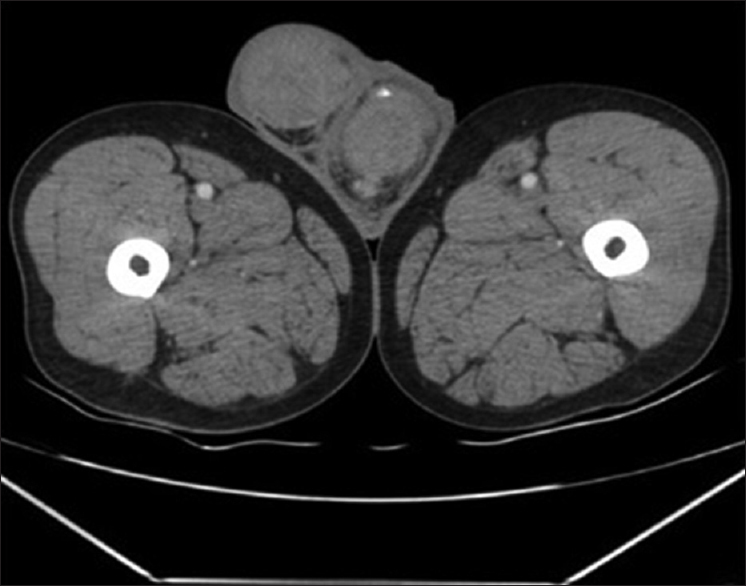 The majority of the cases presented with unilateral testicular swelling with or without pain. Testicular metastases are usually detected 2 months to 9 years after the diagnosis of gastric carcinomas. Few of the cases were misdiagnosed as primary malignancy of the testis before histopathological confirmation due to the similar clinical presentations. The diagnosis is usually based on pathological examination and confirmed by immunohistochemical study. The typically elevated serum markers in the primary testicular malignancies such as AFP and β-HCG are within normal limits in majority of the testicular metastasis. However, both AFP and β-HCG markers may be rarely elevated in gastric carcinomas. On immunohistochemical examination, carcinoembryonic antigen and pankeratin are commonly positive. AFP, β-HCG, CD117, and PLAP are immune nonreactive, which are typically positive in primary testicular malignancies. Most of the patients with testicular metastases undergo orchidectomy followed by palliative chemotherapy as in the present case. In existing gastric carcinoma, metastasis should be considered as the differential diagnosis for patients presenting with testicular mass and needs careful evaluation. Although prognosis of the patients with testicular metastasis from gastric carcinoma is poor, they may respond well to chemotherapy. Kusaka A, Koie T, Yamamoto H, Hamano I, Yoneyama T, Hashimoto Y, et al. Testicular metastasis of prostate cancer: A case report. Case Rep Oncol 2014;7:643-7. Kamble VR, Agrawal PM. Bilateral testicular metastases from occult primary prostate cancer in a young adult: A Rare case report. J Clin Diagn Res 2017;11:TD03-5. Li B, Cai H, Kang ZC, Wu H, Hou JG, Ma LY, et al. Testicular metastasis from gastric carcinoma: A case report. World J Gastroenterol 2015;21:6764-8. Palmieri D, Chambers AF, Felding-Habermann B, Huang S, Steeg PS. The biology of metastasis to a sanctuary site. Clin Cancer Res 2007;13:1656-62. Moriyama S, Takeshita H, Adachi A, Arai Y, Higuchi S, Tokairin T, et al. Simultaneous bilateral testicular metastases from renal clear cell carcinoma: A case report and review of the literature. Oncol Lett 2014;7:1273-5. Kim SO, Choi YD, Jung SI, Oh KJ, Im CM, Kang TW, et al. Prostate cancer with solitary metastases to the bilateral testis. Yonsei Med J 2011;52:362-4. Hatoum HA, Abi Saad GS, Otrock ZK, Barada KA, Shamseddine AI. Metastasis of colorectal carcinoma to the testes: Clinical presentation and possible pathways. Int J Clin Oncol 2011;16:203-9. Nozawa M, Nishimura K, Hara T, Oka T. A case of bilateral testicular metastases from carcinoma of the stomach. Hinyokika Kiyo 1995;41:137-9. Xu F, Wang Y. Metastatic tumour of spermatic cords, epididymis and seminiferous duct from gastric carcinoma. West Indian Med J 2013;62:859-60. Buck DA, Byrd RH, Holmes CL, Pollock T. Testicular metastasis in a case of squamous cell carcinoma of the lung. Case Rep Oncol 2015;8:133-7.